Cameras and photographic equipment are the tools of my trade and not something I usually get sentimental about and neither do I spend time dreaming of owning particular cameras or lenses. There is one exception and that is my Leica MP and my three Leica lenses. When I first saw the MP on it's release several years ago, I wanted one instantly. No, I didn't need a Leica MP, I simply wanted one in the same way a collector of watches would want a Breguet or Rolex, perhaps. There are probably several reasons for wanting something like a Leica MP and I daresay none of those reasons are particularly wholesome or even very sensible, but I bought one anyway. If nothing else, my MP and the awe-inspiring Noctilux f1 lens that I paired it with are a constant reminder of my dear old late Gran. I only wish I could have used it to take a photograph of her. My Leica may have been expensive, but a photograph of my Grandmother would be priceless. Hmm. I've always wanted one of these. I guess there are other alternatives now in the world of digital. But such a quality camera — that is so quiet — is a thing to lust after! Well lust is one of the Seven Deadly Sins, so I am told. That makes me a sinner, Andy. I use the Leica for my personal work and for the sheer enjoyment I get out of making photographs. Shameful I know, but there is no denying the experience is heightened by using this camera. The great thing is you can keep the secret of your sinning to yourself. Few people notice the little Leica MP, I would not have been happy taking a Nikon D3 around this area of Newcastle. Have you played around with the new digital Leica? I have used the M8 (1st version). That camera really could have been something. Unfortunately, it's a joke. Leica did not think this through and no amount of sticking fingers in dykes, scratchproof screens or mounting funny filters on beautiful lenses is going to get them out of the mess they created for themselves. The only way Leica can redeem themselves and hope to be taken seriously at professional level (if that's what they want) is to produce the camera that everyone expects: a full frame M with good low light capability. 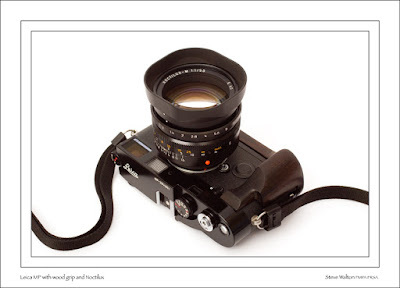 That's what a digital Leica should be, nothing less. That said, the M8 (or M8.2) is capable of producing good quality images, it just doesn't do it in a way that makes it viable for most pros. Something like the Nikon D3 makes far more commercial sense in a world where capital outlay has to be returned. I had an Epson RD1 for a few months and that was a delight to use within it's limitations. It was never a contender as a serious camera, more a novelty as Epson would admit. But it did convince me that a digital rangefinder is a mouth-watering prospect if the manufacturers could only get it right. I will be happy to wait on, it'll come eventually. When it does there will be another small object of desire to drool over!